Undertaking habitat enhancement projects is a key to conserving native flora, fauna and ecological processes. In Stanley Park, SPES’s habitat enhancement projects aim to improve habitat for species of significance, and involve collaboration with the Vancouver Park Board, other professionals, and volunteers. SPES’s ongoing enhancement projects include the installation and maintenance of swallow and wood duck nest boxes, bat boxes and bee condos, as well as beaver tree wrapping, and the construction of predator guards where herons nest. In North America there have been significant changes to wildlife habitat over the past 100 years. 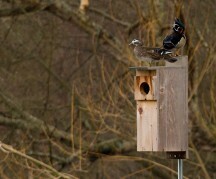 For species such as swallows and wood ducks (Aix sponsa), this change has resulted in a loss of their shelter, food and tree cavity nesting sites. Pollinators, such as bees, are considered keystone species, whose presence influences a larger number of other species that depend on them. Bees and other insects are critical in the production of human food, pollinating over 1/3 of agricultural species. In recent years there has been a rapid decline in native bee populations across North America with the main cause being human activity – the loss, fragmentation, and degradation of habitat, along with pesticide use. North American beavers (Castor canadensis) play an important role in the healthy functioning of aquatic ecosystems in Stanley Park, including Lost Lagoon and Beaver Lake. They create wetland habitat through their damming of waterways and alter their habitat by coppicing (cutimg down trees in order to allow stumps to regenerate) streamside vegetation and dredging plant material and sediments. Beavers are also capable of altering other important wildlife values in these sensitive habitats, and without careful management in Stanley Park, they have the potential to negatively impact some wildlife species.